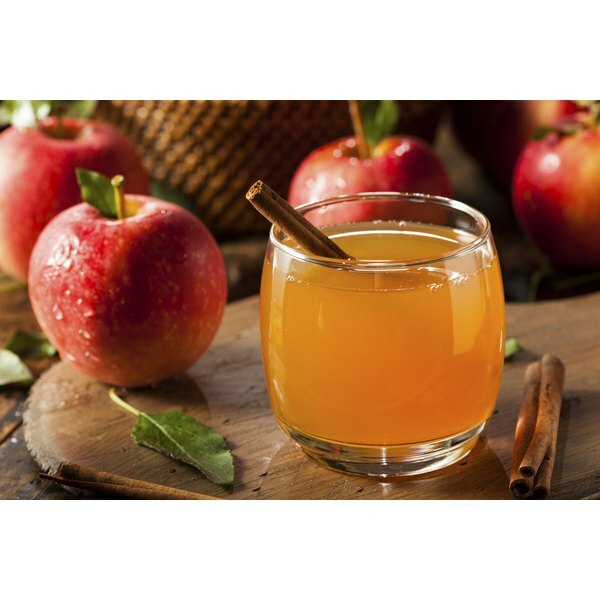 Apple cider vinegar is commonly found in pantries and cabinets in most homes. It provides nutritional benefits, but people who believe in the home remedy potential of this supplement tout the raw, organic, unfiltered kind. Though organic apple cider vinegar is thought to be a weight loss remedy, there is no solid scientific evidence proving this notion. According to the book, "The Healing Powers of Vinegar: A Complete Guide to Nature's Most Remarkable Remedy," by Cal Orey, organic vinegar contains a sediment called pectin that's made up of apple fibers. Pectin acts as a an appetite suppressant, according to Orey, and keeps you feeling satisfied after a meal for a greater length of time. The acetic acid in raw organic and unfiltered apple cider vinegar is also thought to help with weight loss. According to a study published in the "Journal of Agricultural and Food Chemistry" in 2009, mice that were fed vinegar along with a fatty diet gained less fat than mice that weren't fed vinegar. This could mean drinking vinegar prevents your body from accumulating fat. Even though several studies show a correlation between apple cider vinegar and weight loss, there isn't enough evidence to say vinegar causes weight loss. In fact, these studies only show it may help to prevent obesity. According to Katherine Zeratsky, chief nutritionist at MayoClinic.com, vinegar will not help you lose weight in any way. If you're thinking about drinking organic apple cider vinegar anyway, even though there isn't enough evidence to say it helps you lose weight, consider the side effects and discuss its use with your doctor. Vinegar can burn your throat, cause stomach irritation, and wear off tooth enamel. Plus, it can interact with medications, says MayoClinic.com, so it's best to just stick to a sensible diet and exercise plan when looking to lose weight.